Catalog. 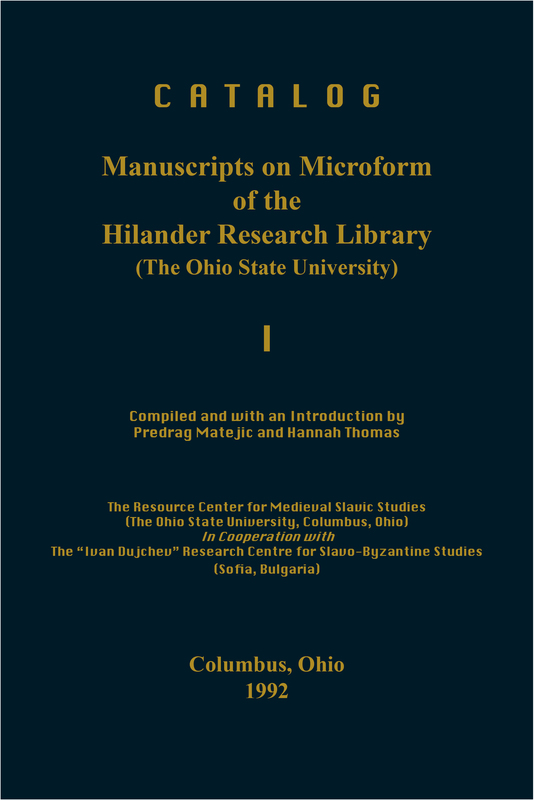 Manuscripts on Microform of the Hilandar Research Library (The Ohio State University). Compiled and with an Introduction by Predrag Matejic and Hannah Thomas. This unique achievement in the cataloging of medieval Slavic Cyrillic manuscripts provides 1,842 catalog records and over two hundred pages of unified indices representing medieval manuscript material brought together on microform in the Hilandar Research Library of The Ohio State University. The originals of the materials span twenty-one collections housed in various countries, most notably much of the Slavic manuscript material on Mount Athos. The catalog records are preceded by a detailed Introduction which provides a history of the Hilandar Research Library (HRL) and visions for its future, as well as specific details about the contents of the catalog records and the indices. While bringing together information from a large variety of existing finding aids, the records also often present new, as yet unpublished, information provided by scholars as they worked in the HRL, especially for the musical manuscripts or pertaining to scribal attribution. The compilers have made a concerted effort to meld the requirements of American librarianship (the use of AACR2, LCSH, etc.) with that of medieval Slavic scholarship as evidenced in existing catalogs and finding aids. By presenting the descriptions in a standardized cataloging format, it was possible to make the catalog records accessible in OCLC and in Ohio State's on-line catalog (LCS), a project funded primarily through Title II-C of the National Education Act. While the publication of the printed Catalog is especially indispensible for scholars and institutions which do not have on-line access to Ohio State's LCS system or to OCLC, this publication is an invaluable reference tool to what comprises some 80% of the medieval microform holdings of the HRL, unique in North America.